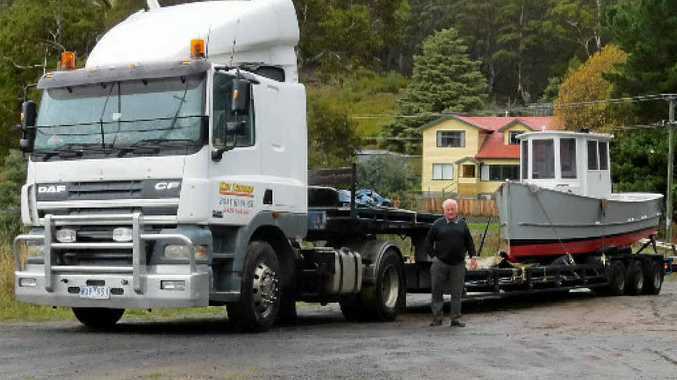 WE were greatly pleased to see our old mate Ken Johnson from Seaford back in Tasmania recently when he called at Collinsvale driving his 2002 CF85 380 Hp Daf towing a 26' hand-built wooden vessel from Andrew Denman Marine at Kettering to Port Albert in Victoria via the Toll ferry at Burnie. It was so good to see Ken fit and well again and bouncing about back to his old self, and back in Tasmania again and over a coffee we caught up with news of many friends on the Big Island, and a get well wish goes out once more to Tommy Buckle in Colac who is still somewhat the worse for wear. Our best wishes to Pam Johnson who is having a difficult time of things at the moment too, and we look forward to seeing her in Tasmania again soon.